More and more people buy the snorkel masks that cover the whole face. They are convenient and allow to breathe through the nose which makes it a lot more comfortable for many people. The available masks are overall pretty similar and at first glance are typically different by color, snorkel length and materials. However, there’s one other difference that is not that obvious. It’s the shape of the lens on those goggles. There are two different types of masks. The first type of mask has this rounded front where it’s curved all the way around on the front. And the second type has a flat front. 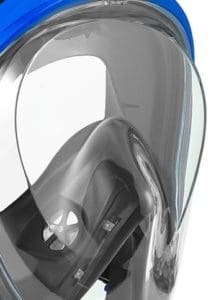 It looks a little bit more like a traditional scuba mask with a lot of transparent glass or plastic added around it to cover your face. A lot of people have been asking, what’s better? What’s the difference between the two? Some companies even sell both the curved front and the flat front snorkel masks. Make sure you know which one you’re getting before you decide to buy. The main difference you can experience between those two types of goggles comes down to visibility. You’ll encounter some distortion with each type of goggle. One has it more pronounced around the edges while the other type has the distortion across the visible area. When it comes to the curved front mask, there’s typically just a little distortion of the actual image due to the curving of the lens. When you’re underwater and you’re swimming around, then you most likely won’t see the world any differently than you do if you wear swimming goggles or have your eyes open. There’s usually some distortion when you’re looking out at the edges of the lens. The distortion you experience is evenly spread across the whole visible area. It’ll end up stronger at the edges where the lens meets the frame as the lens is having a stronger curve in those areas. With the flat fronted snorkel mask, the problem is that there is a little bit of distortion around the edges where the flat part of the lens transitions into the curved portion. That point where there’s a crease in the mask. So, if you were to look at such a mask at where the flat part of the lens goes into the curve, then you do see a little flat line. There’s a little bit of distortion there. And so, it makes it look just a little bit different when you’re swimming. However, when you’re looking straight out, there’s no distortion at all as the lens is not curved at all. Typically, when in the water you will generally look straight out of the mask. At that moment the flat mask has a slight advantage as all the stuff that’s on the side is not what’s in your primary focus. But you notice it. It is there, but you do get used to it. Interesting enough all the major brands that provide such full face goggles like the Subea Easybreath or the Wildhorn Outfitters 180 Degree have flat lenses. Initially, you will probably enjoy the round front mask more than the flat fronted mask, just because the slight distortion of the curve is less evident than the somewhat more obvious one around the edges of the flat mask. The vision feels initially a little more natural. However, if you are snorkeling a lot, then you do get quickly used to the flat front which has zero distortion when you look straight out. You also do get a better feel of how your video camera will record imagery when you look through the flat lens. In the end, though, it’s more important that you get a mask that is of high quality. The type of lens is to some degree secondary. In the end, you will get used to either one and you won’t even realize that there are distortions after a while. One thing you will recognize instantly is if the mask is of low quality. Water dripping in or cheap plastics being used are a much bigger problem than the flat vs. curved lens on the full face snorkel mask. And if you are used to traditional snorkel masks or swimming goggles, then the improvement is so massive that you probably won’t even realize that there are distortions in your visibility. In the end it’s your choice. Pick a mask that offers high quality for a fair price and you can’t go wrong. Try to avoid the super-cheap masks if you want to use them regularly and for a long time. Let us know your experiences in the comments below.